My latest design! Aim to Squeeze Pink Lemonade Blanket is a great baby throw that just screams summer. 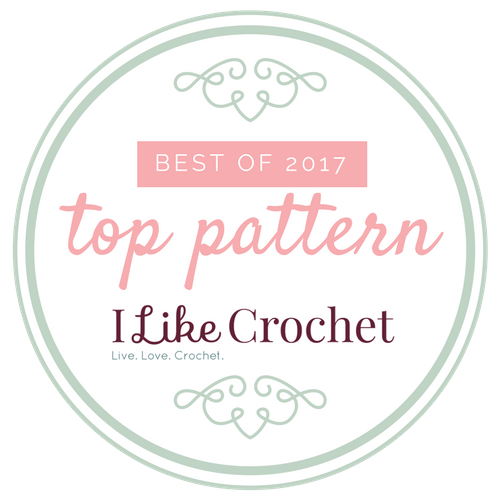 Find it in the June 2018 issue of I Like Crochet. It is worked as a half circle and then is squared up, to highlight a half of a pink lemon slice. I will admit, I really did not know that there were such things as pink lemons, not until I undertook this project. The colors are fabulous together, highlighting a yellow rind, sandwiched between blur and pink, then accented the white. 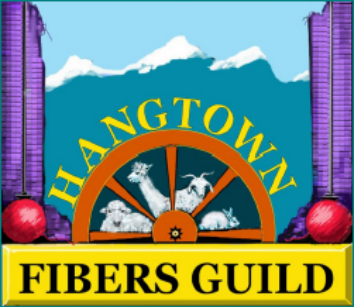 This is a fun project that keeps you engaged, while still allowing you to enjoy yourself. Working the half circle creates all of the lemon segments, you then add the peel and begin to square it up with the blue back ground. You then work the rind between the segments and sit back and relax with a glass of lemonade. The yarn is Baby Soft by Lion Brand, so it is easy to find, and the colors always go so well together. It is soft and nice to work with. If lemons are not your thing, I could easily see this as an orange, a grapefruit, lemon or lime. Any citrus can be worked into this design, making it a bit versatile. 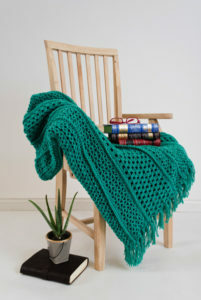 I really like the large size of the half slice, as it really encompasses most of the dimensions of the throw. This really offers great visual interest, and makes for a very appealing addition to your home, or kids room. 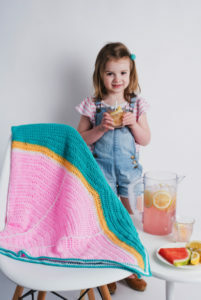 This is noted as a kids blanket, but personally I like it myself as a nice lap afghan, it is a nice size and helps just take the chill off, or when I am on my patio it helps block the sun without being to hot. I had a fun time with this project, and I hope you will too. It seems like a cardigan season! I say that as I have created quite a few cardigans as of late, and the latest one to be released, Serene Spring Long Cardigan found in the April 2018 issue of I Like Crochet, is one of my favorites. I think that long cardigans offer a great shape, as well as keeping that draft off of my waist as a bend over. I enjoy them most with a length about mid-thigh, or at very least just below my hip bone. 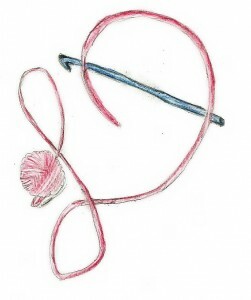 Yet when it is created with a simple stitch, which looks fabulous, it is fun to create too. Serene Spring fits this bill. It is worked from the bottom up, and seamed at the sides, and if you feel that the length is a bit long for your liking, simply reduce the number of rows worked before reaching the underarm. 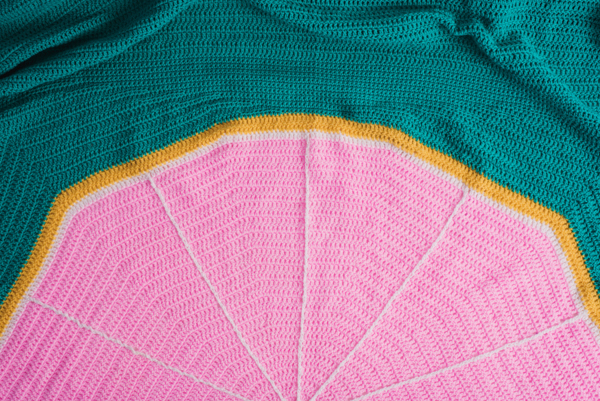 The corner pockets are attached as you seam the sides, and then fully encased when you work the edging. 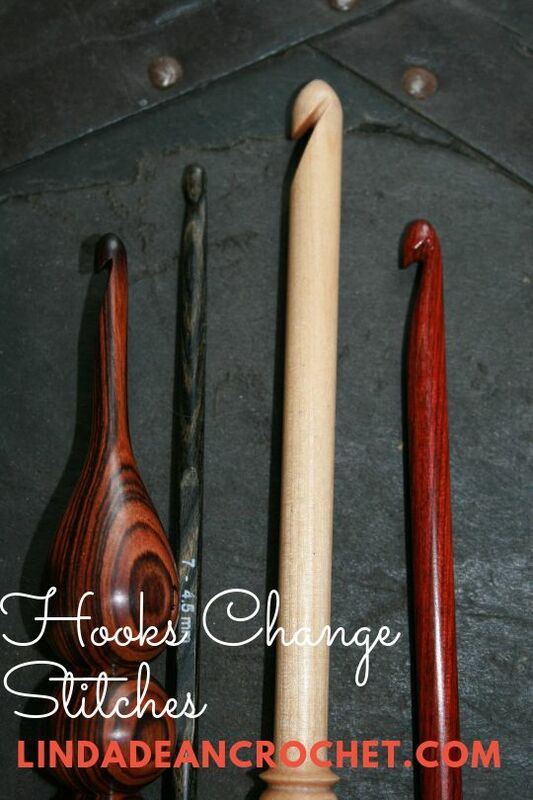 The shaping in minimal, making it easy for a beginner to feel successful. The yarn, Knit One Crochet Too Batiste is a delight to work with as well. It is a blend of wool, linen and silk in a sport weight. It is light and airy, while just being heavy enough to take off the chill. I actually did a review of this yarn, I share more insights about it here. I still remember when I made my first sweater, it took me several years to work up the courage to make one as I had done afghans for years, but when I realized it was all just fabric it was groundbreaking for me. If you have this same dilemma, don’t let it stop you. The best tip I can provide is to check your gauge so you know that you are coming up with the same fabric as what you see in the photo. Here are some tips to working with gauge. I have long found that using a fine weight yarn and a large crochet hook can create some stunning effects, and my latest design is no exception. The Crisscross Mess Top can be found in the Spring 2018 Special issue of Crochet! 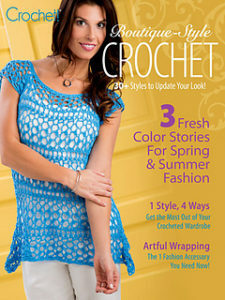 Magazine Boutique Style Crochet and I think that you will really enjoy it. The yarn used for this design, Juniper Moon Farm Zooey DK, is a cotton/linen blend at 60%/40% respectively. It has a slightly uneven texture, being that it is a bit thinner/thicker in some places then others, but not drastically. It is not necessarily the first yarn I would have thought to design with, but I am very happy with the results. Find a more in depth review and thoughts of this yarn from my post in June 2017, here. The design for this top is really pretty simple. It is rates as easy, and honestly….it is. Basically the large hook and fine yarn do all the work. You simply work 2 different size rectangles, and sew them together, then add sleeves. 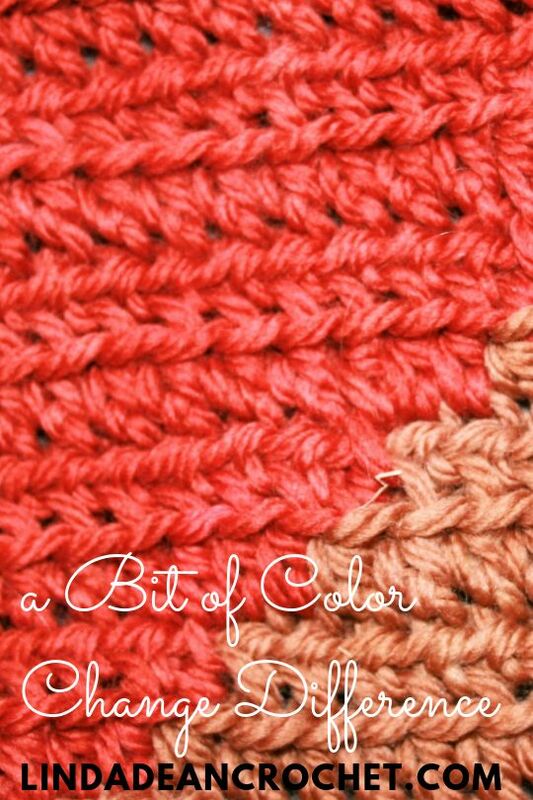 It only utilizes one crochet stitch, so it is pretty straight forward, yet has a really nice effect. There is no need to worry about shaping, or anything of such, the sleeves use what is referred to as short rows. 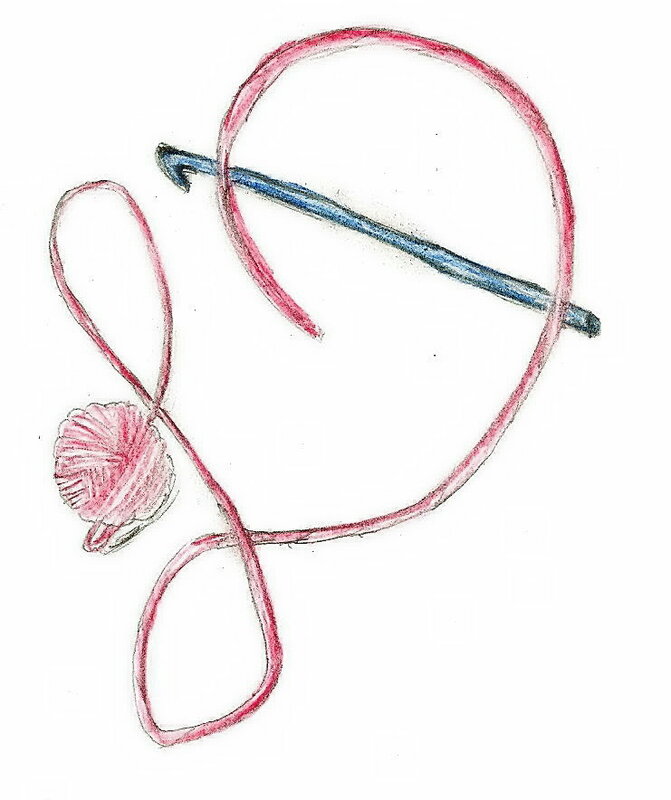 Short rows are basically the act of not finishing a row, leaving stitches unworked, then when returning to work a row in the same direction you then work the unstitched stitches. Basically if you have 10 stitches in row 1, you work 5 stitches in row 2, as a result there are 5 stitches in row 3, then in row 4 you work the 5 stitches of row 3, and the 5 unworked stitches in row 1, resulting in 10 stitches. Really this is the only technique in this design that is not “repeat Row 2”. To help the fabric open up, I actually hung it up when I blocked it. The weight of the wet fiber helped pull the stitches open even more than the stitches themselves. This helps give it a casual chic look. However it is definitely not a “wear it alone” type of top. You want to have something underneath, so that effectively makes this a statement type piece. So if you are looking for a bit of a current fashion statement, give this design a try. There are somethings that really take me by surprise. 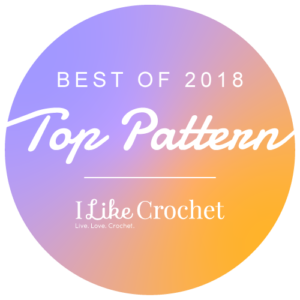 A really pleasant surprise is finding out that one of your designs has been chosen as one of the Top 50 Patterns of 2017 by I Like Crochet Magazine! That is one of the Best of 2017! Of the thousands of patterns and designs that come out every year, I Like Crochet Magazine felt that my Book Club Afghan was among the cream of the crop. It takes me back a bit. Honestly, I am never sure how to assess my designs. I just make the idea that comes to me. I have found over the years that the more I over think an idea, the less I really like it. So I try and keep things simple, and focus on the approach of what it takes to make the design. Maybe it is the fundamental crocheter in me, but my end thought really falls to if I enjoy making it. This is the practice that went into making the Book Club Afghan, just enough stitch change to keep things interesting, just enough repeat to keep the design something that you can relax doing. This is how the lacy panels are worked, in a lengthwise direction with solid stitches between them. The three styles of lace make just enough visual interest, and are just different enough from one another that it is a joy to work. The fringe on this design I fell really helps it stand out, as it offers just a bit of a classic flair. Overall this design has always reminded me of a classic fisherman’s afghan with a modern update, something classic made more current. I know that there are many fabulous designs accepted every year by the publication, and I am honored that one of mine was selected. I guess a truer statement might be that I am humbled. Sometimes a design takes month to develop, multiple practice attempts and hours of thought and planning…others come together like magic. 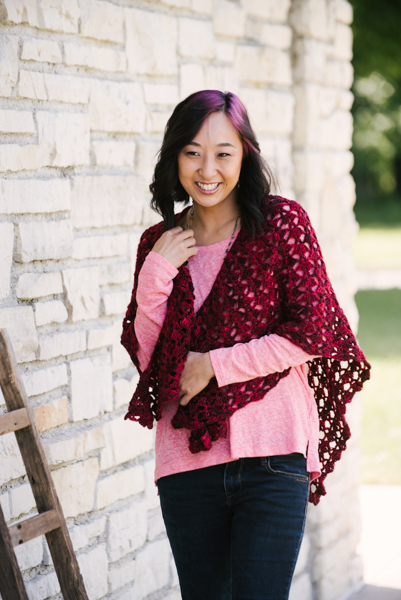 The Royal Blooms Shawl in the October 2017 issue of I Like Crochet Magazine is the latter. This shawl is really great to work up, a relatively simple pattern of V stitches and Shells that yields stunning results. The stacking of these stitches creates an almost jewel shape effect, that lends itself to royalty. While the negative space created shares a bit if a peek-a-boo quality. This is a great quick gift for a friend or loved one, or a special treat for yourself. It can take you from dress to casual fairly easily and thus is an excellent addition to any wardrobe. One of the things I really loved about this shawl is in the yarn. It is worked up in Ancient Arts Reinvent Too. This Wool/Mohair/Silk blend yarn is one that adds enough warmth to utilize this shawl for the crisp evenings of autumn, yet comfortable enough to wear in the mid-day sun. This yarn is listed as a worsted or medium weight yarn, but in the hand I think it works up more like a light or DK weight, so this is not a shawl that is as light or wispy as a feather, but has a bit of substance to it. There are several color ways available, so it can please just about everyone. I wish I had a better story to tell as to how this shawl came into being, but honestly it just fell right off the hook without my even thinking. Part of me thinks that I cannot even claim ownership of this design as it came too easily, so I hope you will enjoy creating your own and making it a new staple in your life.